The Urchin King Mouse is a breed of mouse found in the Sunken City. It is known to drop Mouse Scales and Sand Dollars as loot. Many tales travel the tides of the Rodentia Ocean and this mouse is the centre of one of them. It is believed that the Old One had struck a bargain with one of the Coral Kings of old, offering untold riches and glory for a price. No one knows what the price was or if it was indeed paid but it appears that the Coral King's disappearance is linked with the appearance of Urchin Kings. These mice prefer to be alone and are easily angered. Approach with caution as they are highly poisonous to the touch! The Urchin King Mouse has no specific preference for any kind of cheese. The Urchin King Mouse is susceptible only to Hydro weapons. It can be found in the Lost Ruins zone while on a Dive in the Sunken City. The Urchin King Mouse drops the Deep, Deep, Deep Egg and the Mouse Scale Egg during the annual Spring Egg Hunt. 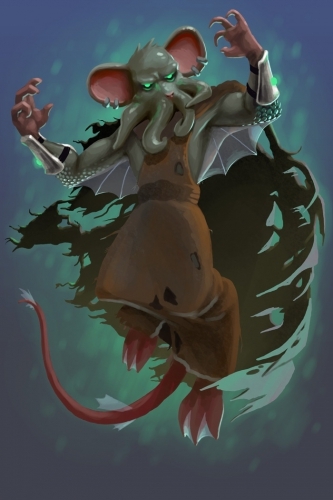 The Urchin King Mouse was released 2 July 2014 as part of the Sunken City content.